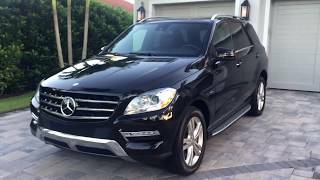 The all new Mercedes-Benz ML350 4MATIC 2012 goes on sale this week in the US. The new ML350 4MATIC is powered by a brand new direct injection V6 engine with 302 hp of max power and 273 lb-ft of max torque. The car is produced at the Tuscaloosa plant in Alabama. The all-new M-Class SUV makes its on-road debut in the U.S. this week. 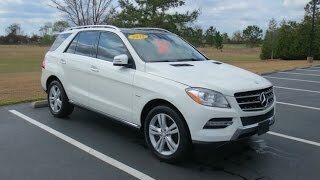 The 2012 M-Class represents the third generation of a highly successful Mercedes-Benz sport utility vehicle that began the industry trend toward SUVs with a more car-like ride. While the dramatically styled 2012 M-Class sits about 3/4-inch lower than the previous model, the new SUV is nearly an inch longer and a half-inch wider. This eye-catching interpretation of a modern SUV makes a strong presence that projects trend-setting design and quality. 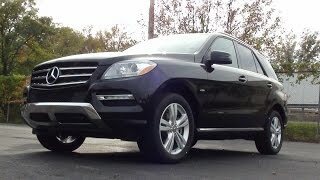 Mercedes-Benz begins the 2012 model year with two M-Class models - the thrifty ML350 BlueTEC diesel now has considerably more power (240 horsepower, 455 lb.-ft. of torque), while the popular ML350 4MATIC is equipped with a brand new direct-injection V6 engine (302 hp, 273 lb.-ft.). The nose of the 2012 M-Class is dominated by a bold front grille that holds the familiar three-pointed star logo in the center, while a chrome skid plate curves from the front bumper up toward the grille. Bracketing the front grille, newly designed headlights are flush-mounted in the fenders. New LED daytime running lights are recessed in the front bumper. Its bold proportions are defined by a relatively long wheelbase and short overhangs. The lines along the sides appear stretched, including a high belt line accented with stainless-steel trim, and its roof line slopes down toward the rear, emphasizing the sportiness of the new M-Class. Striking chrome luggage rails run the length of the roof. Reminiscent of previous M-Class models, an angled C-pillar distinguishes the SUV from its competitors. The dynamic interior design of the new M-Class underscores the spacious width of its new cabin and fosters a sense of well-being with elegant high-quality materials and attention to detail. Interior trim includes wood and aluminum elements with controls in a silver shadow finish. Soothing ambient lighting, which can be switched between 3 different colors, is available as part of the optional Premium 2 package. A sporty, four-spoke steering wheel frames a hooded twin-gauge instrument cluster. The left gauge houses the analog speedometer and fuel gauge, while a tachometer and coolant temperature gauge are on the right bridged by a 4.5-inch screen that can display a wide range of useful information, including a trip computer and GPS navigation directions. The steering wheel holds paddles for shifting the transmission manually and multifunction buttons for scrolling through menus on the driver’s display. The buttons can also adjust the audio volume, make and take phone calls, or activate the voice control system. Newly-designed stalks on the steering column for turn signals, highbeams, wipers, cruise control and transmission mode make the new SUV easier than ever to drive. Perched at the top center of the dashboard in order to minimize driver distraction, a seven-inch COMAND display is bordered by large swiveling air vents. The new head unit comes with a ten-gigabyte music storage hard drive, SD card slot, and an MP3 compatible CD /DVD player as well as a Bluetooth interface for wireless audio streaming and hands-free phone operation, HD/AM/weatherband radio, an FM phase-diversity twin tuner and a USB port hidden in the storage compartment of the center console. An optional hard-drive-based GPS navigation system offers many new features, including a 3D display, a compass overlay, dynamic route guidance, the ability to show alternate routes plus the functionality to record routes while driving. Also optional, a Sirius-XM feature can provide real-time traffic and weather information on the navigation map. The 2012 M-Class line also features a new transmission with a more advanced torque converter lock-up clutch that provides even better fuel mileage, more responsive driving, quieter operation and increased durability. The new transmission is also designed to work best with a new type of low-drag ATF fluid, colored blue instead of the usual red. With 302 horsepower and 273 lb.-ft. of torque, the 3.5-liter V6 engine has 13 percent more power than last year. Assembled in an entirely new block with 60-degree cylinder angles, the latest V6 doesn’t need a balance shaft for smooth operation. Like its predecessor, the new engine has aluminum cylinder heads, pistons and cylinder block (with cast-in Silitec cylinders), as well as a crankshaft, connecting roads and valves made of special forged steel. The new V6 engine makes use of industry-leading electronics technology first used on Mercedes-Benz diesels - electronic fuel injectors that spray gasoline directly into the combustion chambers rather than indirect port fuel injection most gasoline engines used in the past. Featuring a piezo-ceramic crystalline element that changes shape instantly when electrical current is applied, blazingly fast piezo injectors make it possible to design very sensitive and precise injection systems, including the ability to program several small injections with each piston stroke. The ML350 BlueTEC is powered by a purpose-built 3.0-liter V6 diesel, now with 240 horsepower, an astonishing 455 lb.-ft. of torque and 30 percent better fuel economy than a comparable gasoline engine. Using several technologies to minimize diesel exhaust emissions, the ML350 BlueTEC begins with a four-valve-per-cylinder diesel featuring centrally located piezo-electric injectors, CDI direct injection, a variable-nozzle turbocharger and exhaust gas recirculation. ATTENTION ASSIST Cautions "Time For A Rest?" Among the many standard life-saving features on the M-Class is the innovative ATTENTION ASSIST system that can alert the driver to the first signs of drowsiness, a factor that causes more than 100,000 accidents a year in the U.S. A steering sensor is coupled to smart software that uses 70 parameters to establish a unique driver profile during the first 20 minutes of driving. Between 50 and 112 mph, the system identifies the erratic steering corrections drivers make as they begin to get drowsy and triggers an audible warning, and a "Time for a Rest?" message with a coffee cup icon appears in the instrument cluster. Coinciding with the debut of the new M-Class is the launch of the all new Mercedes-Benz iPad® Docking Station. With this new product, customers are able to utilize their own mobile entertainment. They now have the capability to watch movies, play music, view pictures, play games, surf the Internet, all from the convenience of their own iPad® without having to hold it in their hands while in transit. The iPad® Docking Station holds the iPad® in place behind the headrests of the front seats, allowing rear occupants to view. For optimum viewing, the iPad® Docking Station can be rotated up to 90 degrees and be tilted, while being charged through the vehicle's electrical system. This product is a perfect fit for the Mercedes-Benz customer and will be available for most Mercedes-Benz passenger cars and Sport Utility Vehicles. This product will be available in September 2011. Along with the R-Class and GL-Class, the M-Class sport utility vehicle is produced at the Mercedes-Benz plant in Tuscaloosa, Alabama, which began production in 1997 with the first-generation M-Class. Since 2001, more than $600 million has been invested to expand the facility for production of the three SUV lines.